Written and shared by Heidi Siwak. 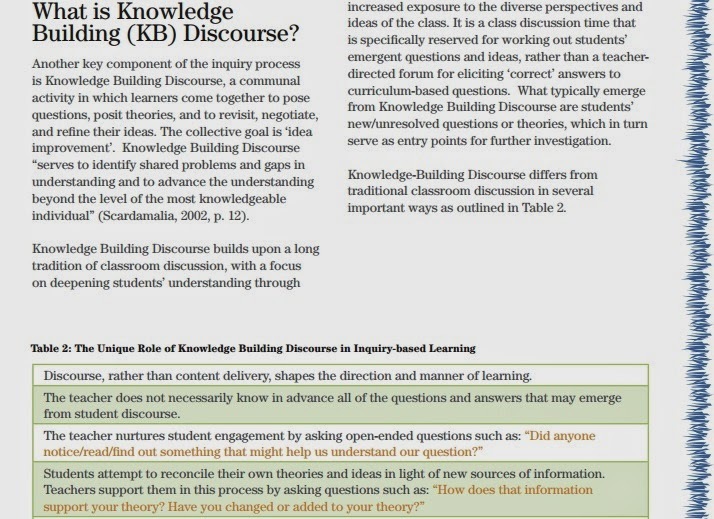 This is a quick overview of how a Knowledge Building Circle is used to build collective knowledge. Day 1: Provocation: Canada is removing the humpback whale from the threatened species list. One student is aware of the story and quickly brings the rest of the class up to date. There are 2 very different reactions. For some this is good news; the species must be safe now. For others this is terrible news; we’re not protecting whales. We remind ourselves to climb down our ladders; this is something to be explored. 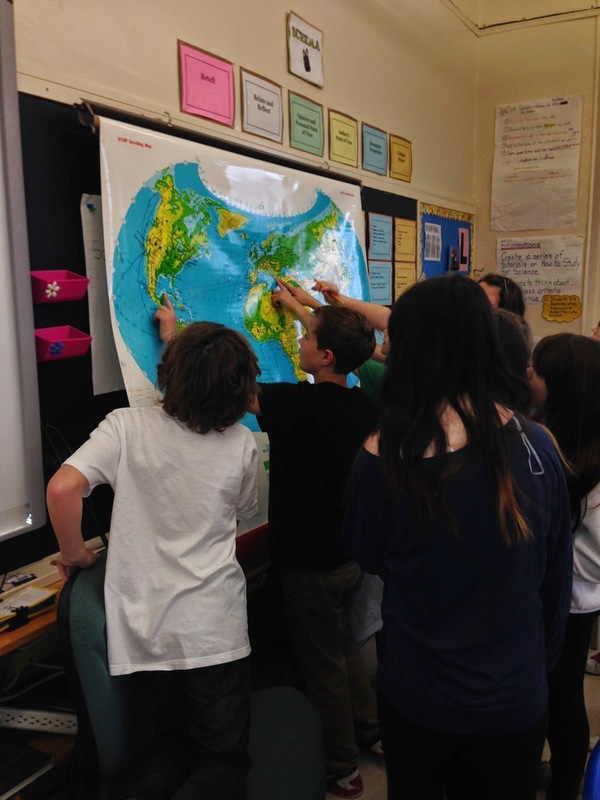 I lead students into a discussion of Canada’s role and responsibilities in a global community. I then ask them to think about what a global community is and what they actually know about the world. Students discuss places, name a few environmental issues and one or two organizations including the UN. It is surprising how little they were able to put forward about the world. There are many things they have “kinda” heard of and many misconceptions. 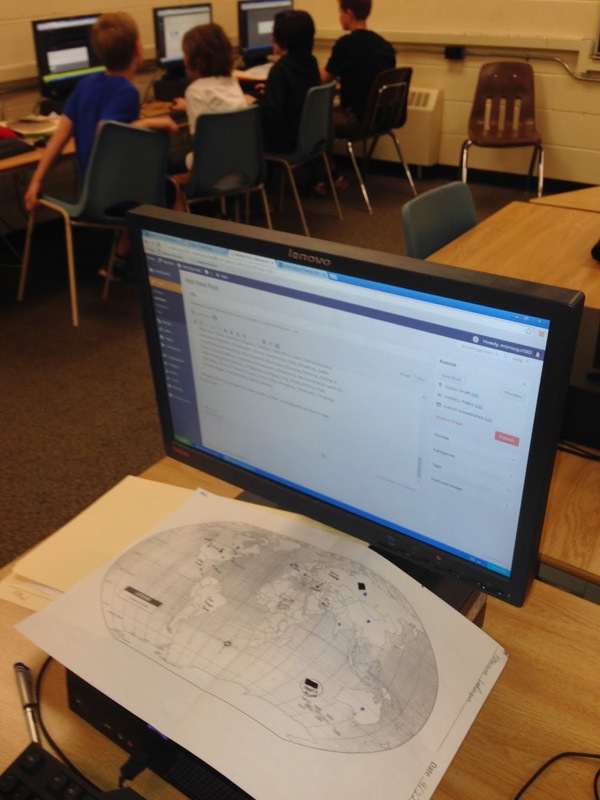 As we talk, students map their current model of the world including places, events, issues, people and news stories. 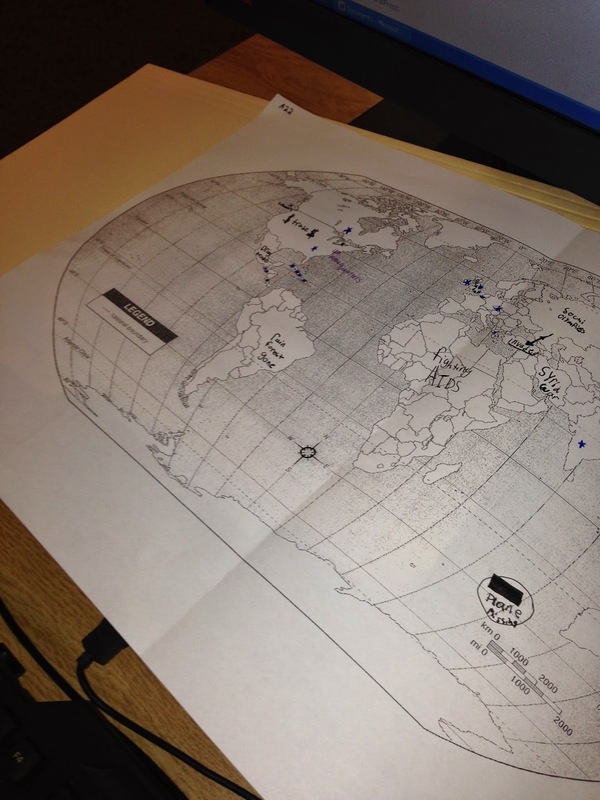 This is a map that they will continue to build as they learn about the world. The roll up map is a popular tool in our classroom. It comes down frequently for various reasons. 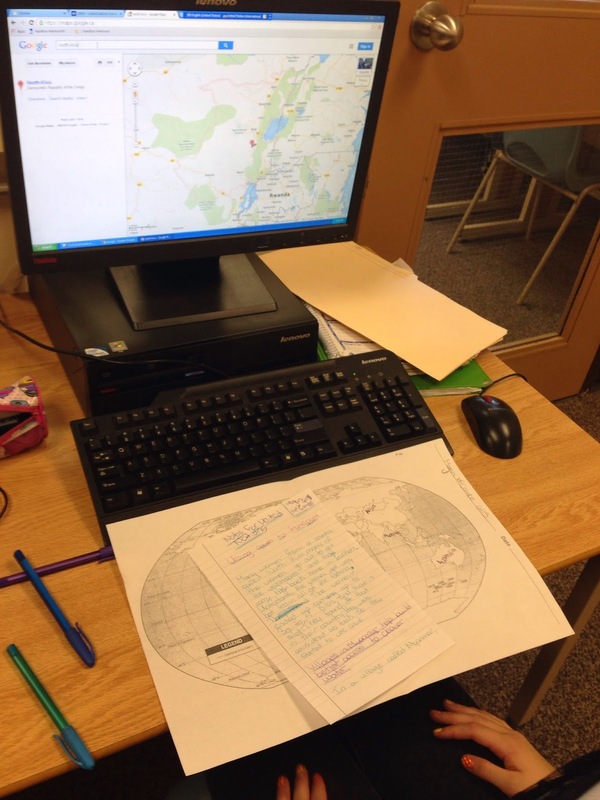 Here students are confirming place names before they add them to their global knowledge maps. 1. It must be in the middle of the ocean because that is a place that doesn’t belong to one particular country. 2. It might be in Antarctica because that is also a place that doesn’t belong to one country. Students decide to find out. 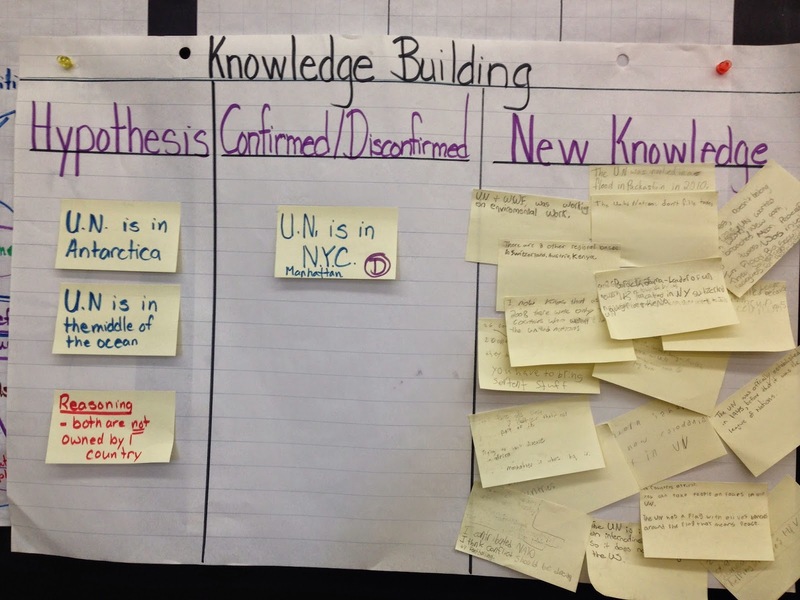 They head to the lab and begin constructing knowledge on the United Nations. 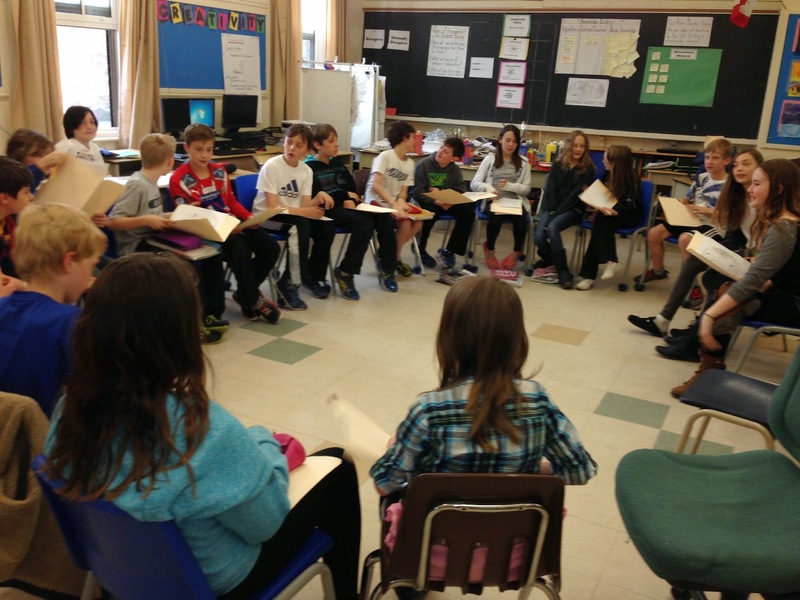 We hold a knowledge building circle where each student shares what they discovered about the UN to help build the collective knowledge of the class. As information is shared students discuss and use words such as assumption, I’m on the Ladder, and the language of disagreement as they clarify their understanding. New knowledge is added to the chart above. As discussion unfolds, students become more careful about word choice. Conflicting information emerges; students grapple with the information until clarity is reached. For example, various dates are mentioned in relation to the start of the UN. Eventually the group distinguishes between the League of Nations and WWI, Franklin D Roosevelt and WWII, and the physical construction in Manhattan that sits on neutral territory. 1. This is an application of the most effective communication pattern for learning. 2. It is interesting to find out what others have learned. The idea that we are building a community of knowledge is beginning to take hold. Day 3: During the discussion students find out that our Prime Minister is not supportive of the UN. There are several gasps so I draw their attention to the Ladder of Inference and ask, “Who has just jumped up the ladder and concluded this is a bad thing?” Several hands shot up (including mine) One student speaks up and says that we really don’t have enough information to decide if it’s good or bad. We climb down our ladders and decide we need to learn more. I direct the students to United Nations Development Program as a starting point. As they construct knowledge there are expectations. 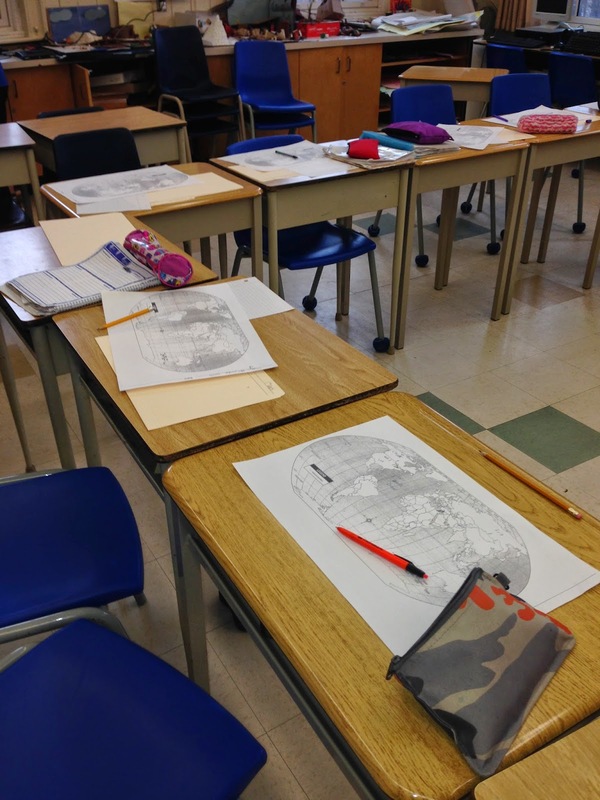 As they read/view about places and projects, they must use Google Maps to find where those places are and add them to their paper maps to show how their understanding of the world is increasing. They must also bring something they’ve learned to tomorrow’s Knowledge Building Circle. 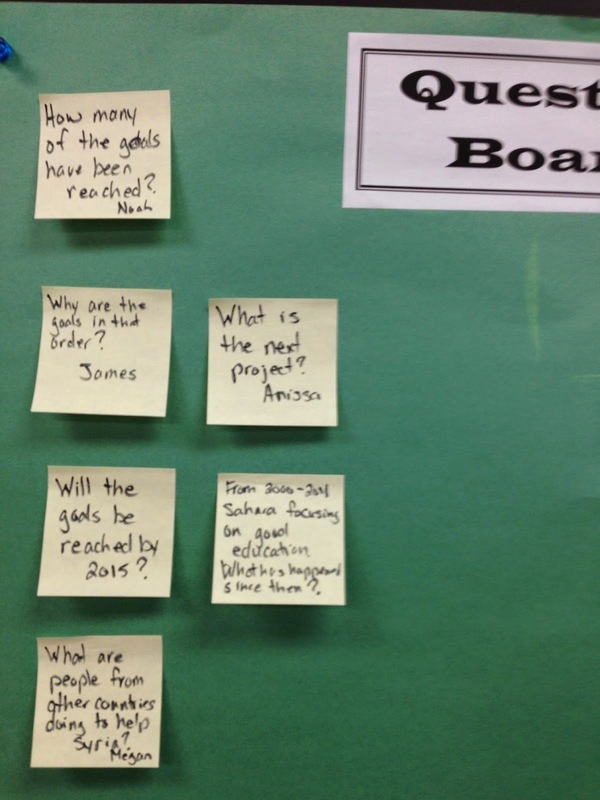 As students work they converse with those nearby about their learning, help each other interpret charts and graphs, call me over to share what they’ve found out and pose questions which are recorded on the Question Board. A remarkable moment of thinking happened during this process. James noticed that the 8 development goals are in a particular order and wondered if the goals are ranked by priority. He then worked out a more efficient order because he felt that if certain problems were solved first, other problems would automatically be addressed. He independently created a causal model. 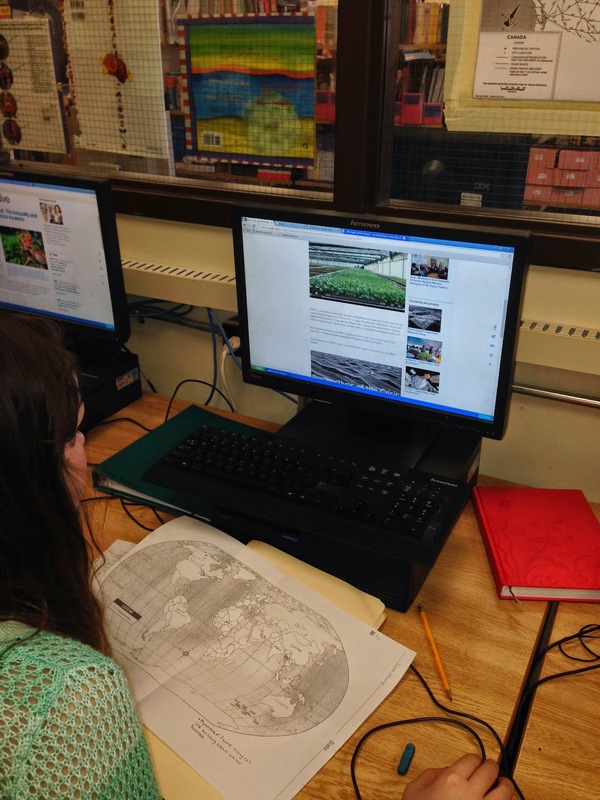 Several students added interesting information to their blogs. Heidi Siwak is a middle school teacher whose innovative work is creating new models of learning. She has been recognized by the Globe and Mail as one of Canada’s innovative teachers. Her students undertake original projects that challenge the boundaries of learning. Heidi and her students have won national awards for innovation in education. 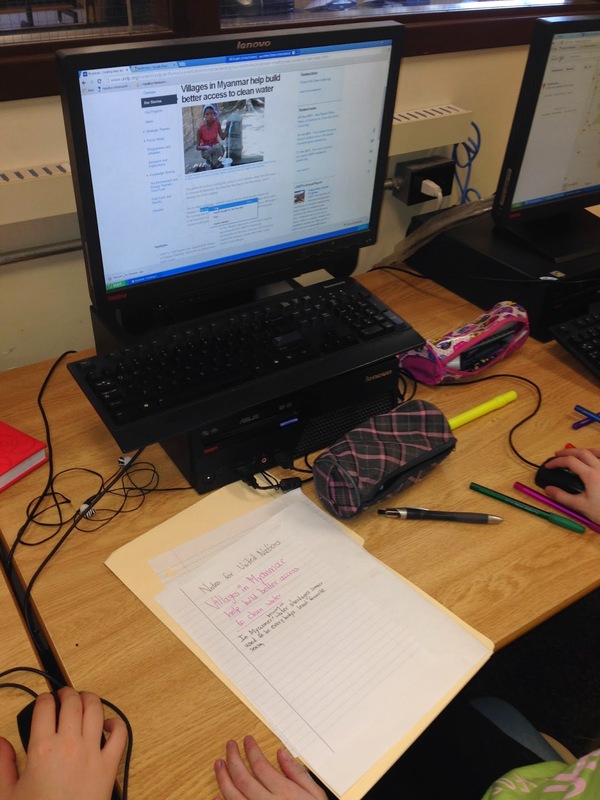 She has been featured on TVO’s Learning 2030 series and as a guest blogger. Her blog is carried by CBC’s digital media service in Hamilton. Heidi is currently exploring Integrative and Design Thinking with her students. She is recognized as an inspirational speaker and is available for workshops.